I looked up the words on Dictionary.com, and neither definition fit this application, so, yes, I just made up a definition. Wow, I feel like I”m back in grade school again and didn’t do my English homework!! What if for a small investment and a little thinking ahead (even a quick shopping trip), you could cement your message in the minds of your audience? What if that same effort resulted in your men being equipped to share spiritual lessons with their wives, children, and friends? These are the power of touchstones, and while effective with all audiences, they can be especially helpful with men. There’s a similarity between these and what in many childrens and youth ministry circles are called “object lessons” – lessons which are often the most remembered part of a church service. 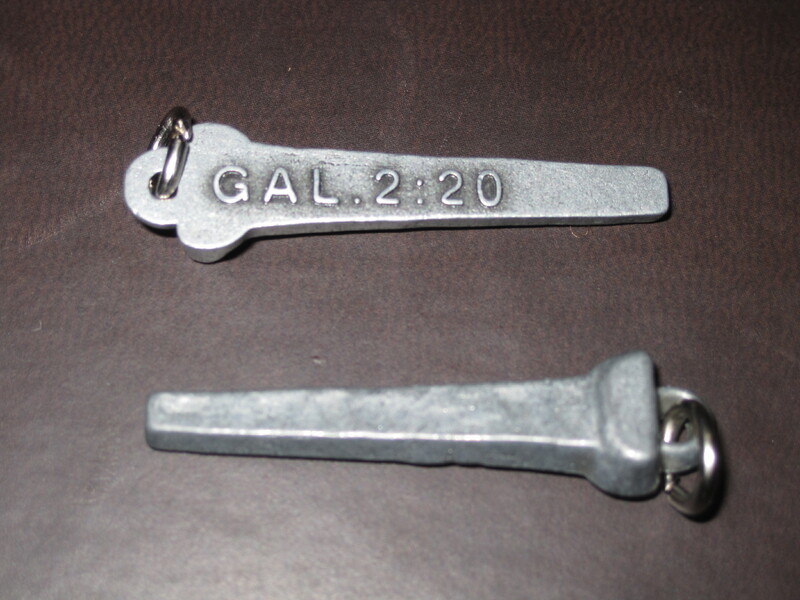 Here’s the main difference – with an object lesson, you share an object and teach a Bible lesson around it. With touchstones, you’re actually sending the reminder home with your audience. Why? 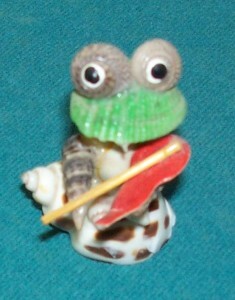 For the same reason many people have snow globes from New York or ugly frogs made of shells from the beach. Emotionally the trinket takes you back to the experience you had years, sometimes decades before. We’ve added this page because we’re surprised how little this idea is shared or talked about. Here’s how it works. In preparing your message, think of ways to connect your talk back to a small token (of minimal cost, you don’t want to be giving everybody Super Bowl tickets!) Either during your talk or at the end, distribute this object to the audience and close by bringing their minds back to the key point you want them to remember. Challenge them to carry the object with them that week (or longer). Then, as your men empty their pockets at night, they will see the touchstone and what they heard. As they grab change for coffee at work, they will see it and perhaps use it to spark a conversation with their coworker(s). Fathers can take it and share the lesson with their families. Nails given out by Joe White. 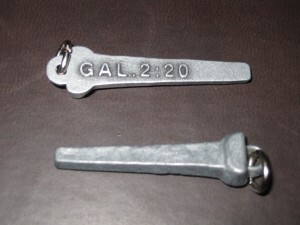 Speaker Joe White has used touchstones with great success – most notably (in my mind) with a small nail with Galatians 2:20 on it that he uses following talks about the cross of Christ. Some churches tie their touchstones to a “Men’s Huddle” at the end of the service, where only men of a certain age are invited forward for a final quick point (2-3 minutes tops) and the touchstone. Some men will “collect” the touchstones and can look at the pile of miscellaneous items months later and still recall the key point or action plan of the message. How many of these same men do you think remember the last month of acronyms, four points and an application, or 7 lessons from Scripture brought to you by the letter ‘C’? Below are just a few ideas, to help you get started, but mainly to trigger additional thoughts and ideas of your own. In time, a simple walk through the Dollar Store may generate more touchstone ideas than you have messages to speak! If you use these ideas or the concept in general, drop us a line and let us know how it turned out. – Read more about touchstones (and many other ideas that can help your church connect to men) in David Murrow’s “Why Men Hate Going to Church” (revised for 2012). You can also read about one church’s experience with touchstones and the men’s huddle (along with other great teaching ideas for men) on Dave’s website, www.churchformen.com. I have been using small river stones for about a year now. I use Matt. 16:13-18 to encourage believers in the foundation Stone of “the Church”. Jesus is the Christ, the Son of the Living GOD and upon this revelation the gates of hell will not prevail! Hold the line and forward men! Their are many other passages I share after the initial small stone or chip off the the old Rock. Build my house on the Rock. There are hundreds of references of God as our Rock! Many hymn lyrics use rock. On Christ the solid rock I stand, He hideth my soul in the cleft of the rock, Rock of ages, We will, we will rock you! Well there is some rock solid humor in there somewhere. Fantastic John – and another great thing is that they are very inexpensive. River stones also have the advantage of not tearing up pockets like chipped rocks or rough samples, and can serve as a reminder that over time we are polished, however particularly with men we need to be careful that the polishing doesn’t necessarily mean getting rid of all rough edges. Conflict is necessary in our lives, and true discipleship and life change won’t take place without friction – as Iron sharpens Iron! Thanks for the note, I was on the edge of deleting comments on this page as we get far more spam than real comments. Thanks for stopping by!